I loved our time in Charleston! Even though we went to the beach each day, we stayed in Charleston so that we could spend every evening there. We arrived with no plans, which allowed us to eat what and when we liked and go wherever we felt like going. Charleston is full of beautiful things: old buildings, colorful houses, pretty flowers. i love your pictures! esp the first one. did you get to ride that teal bike?? Your pictures are awesome! 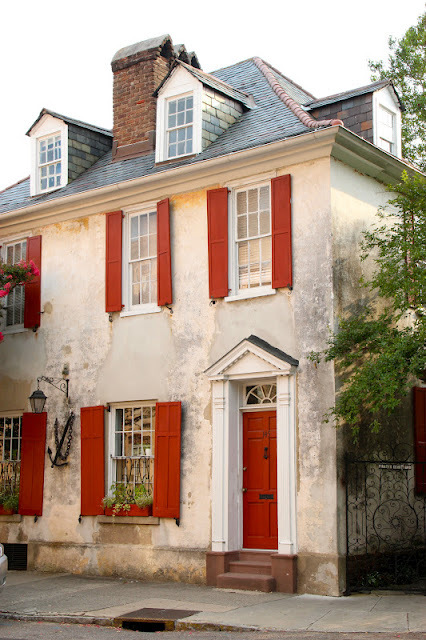 You make me want to plan a weekend trip to Charleston this fall! Great pictures; I love all the ones of the houses! Amazing photos! I like that you made no plans for your whole vacation :) I think we'll have to do that for one of our vacations. Just relax and do as we please. I really want to take a beach vacation soon. Wow you weren't kidding! Charleston IS gorgeous and your photos truly capture that! Your photos are so gorgeous!! Are you planning on framing any of these? They are totally frame-worthy! My favorites are the gray house with the red door and shutters, and the one looking down the street at all the beautiful houses. Great photography, Sherri! I am SO jealous!I have always wanted to go to Charleston!It looks just as beautiful as I have imagined it! So fun! I have heard such amazing things about Charleston! AMAZING photography!! Gaahh, I love it all and now want to visit there someday! Beautiful pictures! I can't wait to visit there one day! oh goodness - a whole week in charleston! i'm so jealous. how i would love to wander around there more at night. your pictures are amazing - the trees, the flowers, the houses, the food - you capture it all so perfectly. it's such a gem of a city. What kind of camera do you use? Your pics are gorgeous! Now you have really made me miss Charleston!